It is with mixed feelings that I write of the passing of Choden Rinpoche, a Tibetan Buddhist master, born in 1933, who spent 19 years under house arrest in a windowless basement after the Chinese takeover. He has taught the dharma to thousands of students around the world since his release in 1985. 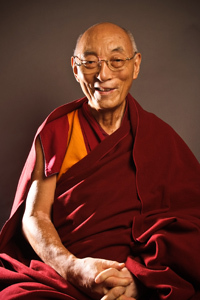 I was fortunate enough to encounter Rinpoche in 2012, and posted This summer I met a hero after attending a series of initiations and teachings in June and July of that year. I was able to study with him during subsequent summers, through June of this year, but ominously, he ended his U.S. sojourn, normally several months each year, after less than two weeks, to return to Taiwan. Several of us wondered then if his health was involved. Choden Rinpoche passed on September 11, at 1:30 am, India time, after completing nearly a week of end-of-life ceremonies, and reportedly telling his closest disciple of plans to carry forward his work, and details of his next rebirth. “Rinpoche” is a Tibetan honorific meaning “Precious One,” and is given to those who are confirmed to be past masters, male or female, who consciously took rebirth to continue teaching the dharma for the benefit of all living beings. Before leaving the U.S. for the final time this June, Rinpoche promised his students he would return. That’s the good news. The bad news of course, is that it won’t be in this life. May we all benefit from such an example, and aspire to live and die meaningfully, with sanity and compassion, in a world that desperately needs both. This entry was posted in Buddhism, Tibet and tagged Buddhism, Events, H.E. Choden Rinpoche, spirituality. Bookmark the permalink.